This article is about the car found in GTA V. For the car in GTA San Andreas, see Elegy. An Elegy RH8 in Grand Theft Auto V.
Born in the fires of Mt. Fuji and tested on some German toll road, you can finally legally own this legendary supercar without the fear of having your door kicked in by the FIB because they'd rather crush import cars than catch terrorists. The Annis Elegy RH8 is a 2-door sports coupe featured in Grand Theft Auto V, as the successor to the Elegy featured in Grand Theft Auto: San Andreas. The front of the Elegy RH8 is primarily based off of the Nissan GT-R (R35), most likely the V-Spec version. It also appears to be based on the Toyota 86 Concept. The rear of the vehicle seems inspired by the third generation Mazda RX-7 and the Arrinera Hussarya. The Elegy RH8 has a 3 liter 560 hp engine (possibly a V6) coupled with a front engine, all-wheel-drive configuration. It accelerates from 0 to 60 mph within 2.7 seconds, making it among one of the fastest accelerating vehicles in the game (only beaten by the Zentorno, which can do the same acceleration in 2.3 seconds). The Elegy RH8's all-wheel-drive system also gives good grip on all wheels, allowing for better cornering. It has a top speed of 197 mph (317 km/h), decent for a car of its performance. 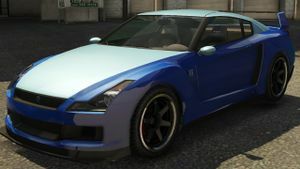 The Elegy RH8 is available free of charge to members of the Rockstar Games Social Club, either from "Special Vehicles" list in the player's garage in Story Mode, or from Legendarymotorsport.net in Grand Theft Auto Online. "RH8" may be a reference to the Mazda RX-8. "RH8" is also a reference to Club RH9, a Japanese tuner of Nissan GT-Rs. The Legendarymotorsport.net description references the Nissan GT-R's predecessor, the Nissan Skyline GT-R (R34), which was largely only sold in Japan and remains an extremely rare import elsewhere. The R34 is currently outlawed on American roads, an issue which was rectified with the R35 by making it an officially sold vehicle in America. This page was last modified on 24 June 2015, at 04:37.